Before there was Palm Beach, there was Thomasville. I learned this a few years back, on a writing assignment, while interviewing the descendants of one of America’s wealthiest families. In their stories, these descendants kept making casual mentions of their family’s “plantation” in Thomasville, Georgia. Yes, plantation. Even as a child of the South, I found that word a little jarring. The more they talked, the clearer it became that Thomasville was a fall and winter playground for America’s elite. So, when an opportunity to partake in the first ever Red Hills Rover Rally in Thomasville arose in mid-November, a mere 180 miles from my home in Florida, how could I resist? 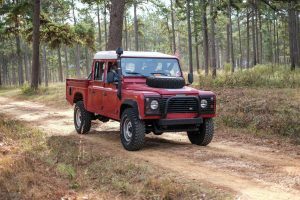 Not only would it be a chance to see Thomasville, it was the perfect reason to put my as-yet-unnamed ‘91 Defender 90, with its new transmission and power steering, through its paces. You see, until recently, Land Rovers had been my husband’s passion alone, one I begrudgingly tolerated in the name of marital harmony. But a funny thing happens to a woman when life with three children forces her to start driving a minivan. My practical minivan made me feel like I’d lost at life. 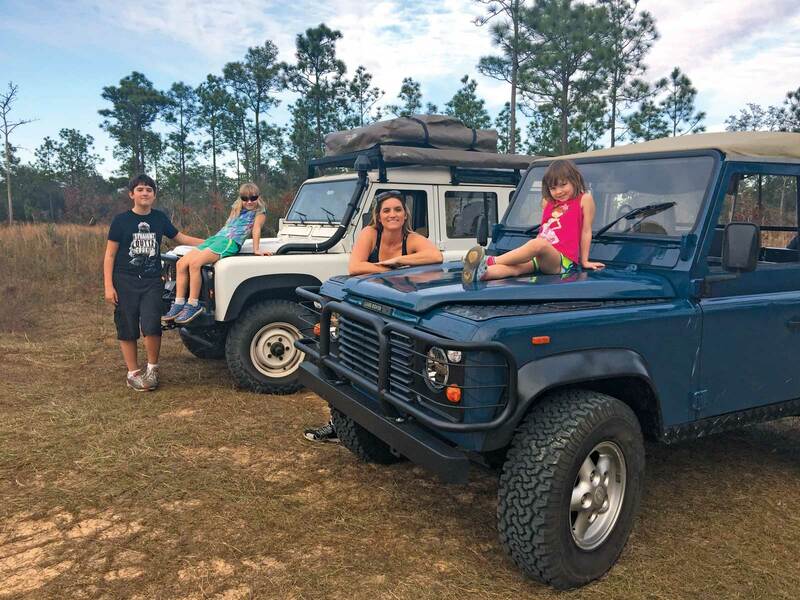 My RHD D90 soft top with the totally-not-safe-for-three-children-so-they-aren’t-allowed-to-ride-in-them jump seats in the back is my last stand against adulthood. I imagine a few of you can relate. I knew when my husband suggested a D90 for my fun car, and gamely offered to do all the maintenance for me, he really just wanted a D90 for himself. But still, he does all the maintenance, I get a fun car and he gets a backup Defender for when his 110 misbehaves (which happens a little too often for marital harmony). Everybody wins. We’ve been married for 14 years. We’re starting to get it. 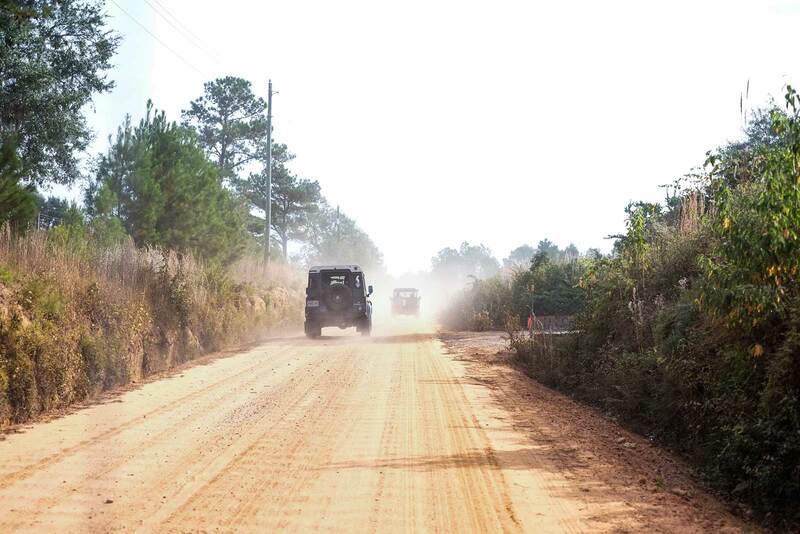 Our Land Rovers headed towards Thomasville, about 40 miles north of Tallahassee. When Henry Flagler pushed railroads deep down the Florida peninsula in the early 20th century, Thomasville was the literal end of the line. The mild climate and abundant land and wildlife drew the attention of wealthy northerners, many of them investors in the railroad, and in the late 1800s they began buying and building homes in the area, turning Thomasville into a wintertime resort. Those wealthy northerners came year after year to spend a season devoted to socializing, hunting and fishing. Even today many of their descendants continue to visit Thomasville every fall. 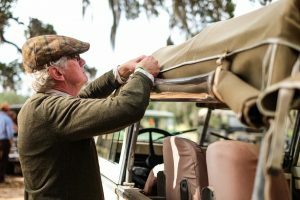 Today Thomasville is the region filled with hunting plantations — and yes, they really do use that word — that stretches farther north into Georgia and south into Florida. But plantation in Thomasville means what ranch does in Texas, or farm does in my native Tennessee. No one necessarily grows anything on a Thomasville plantation or a Tennessee farm, and it is altogether possible to own a ranch in Texas and be all hat, no cattle. What this means is that in Thomasville plantation just means a huge tract of really beautiful land. We’re in Gatsby territory here, except it’s Gatsby outfitted in Orvis and Filson, drinking sweet tea, eating a fried chicken biscuit and driving a gorgeous restored Defender 130, more 130s than I’ve ever seen in one place. Thomasville made good on that goal. The Rally was just one event during the annual 10-day Festival, now in its 21st year, which showcases the work of artists and artisans who celebrate hunting and fishing culture in their creations. The Rally started at the unbelievably gorgeous Pebble Hill Plantation (http://www.pebblehill.com)and wound through the wire grasses and longleaf pines on Hines Hill Plantation, skirting Beverly Plantation and Myrtlewood before stopping at Greenwood Plantation for Bloody Marys and to take in Greenwood’s stunning views. Greenwood has a rarefied history. 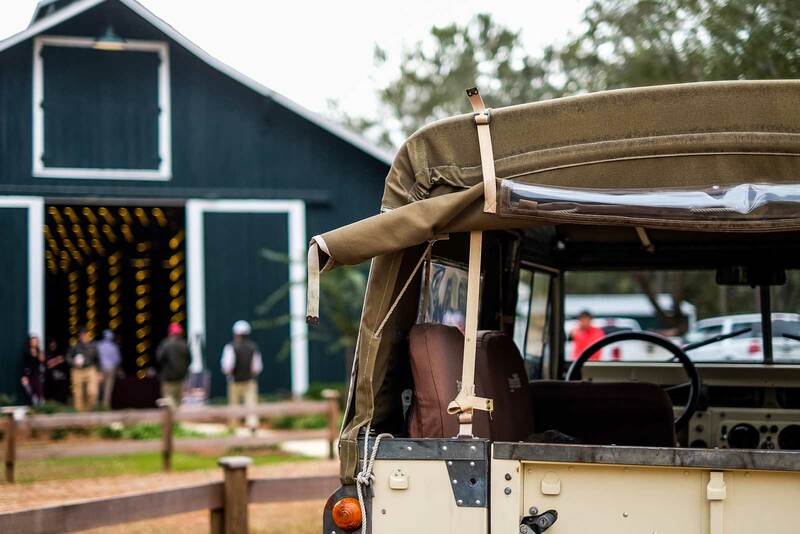 Owned for much of its existence by the Whitney family, Greenwood hosted Presidents and movie stars, all drawn to the moss-draped oaks and rolling pastures for riding horses and hunting quail, turkey and waterfowl. After President John F. Kennedy’s assassination, Jacqueline Kennedy grieved in the quiet refuge at Greenwood. I thought about a devastated Jackie, going for long walks on the serenely beautiful property, seeing some of the same things I was seeing, as I moved into one of the buildings to freshen up. I caught a glimpse of myself in the bathroom mirror and was pleased with my healthy-looking tan —until I wiped my face with a tissue and the tan all came off, leaving an ugly smear of brownish red on the tissue. The entire South had been in a rather desperate drought and the Red Hills region gets its name from all the red clay soil. By the halfway point in the ride, red dust had coated absolutely everything. 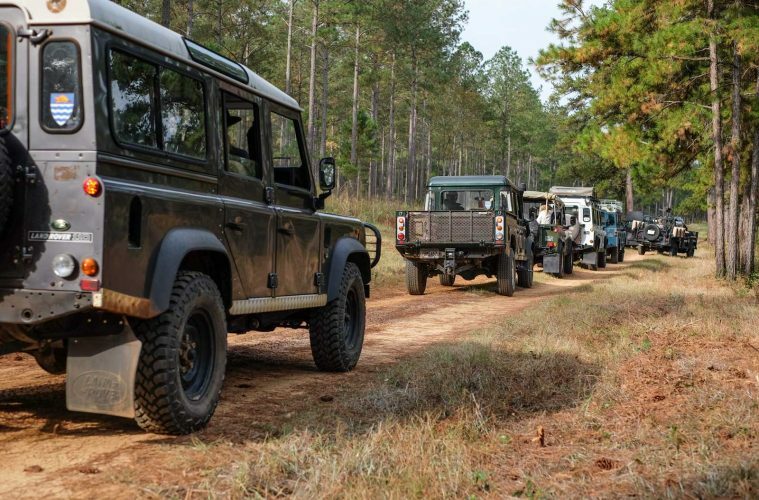 After the Bloody Mary break, we all loaded up to drive the remaining course past Twin Oaks, through Sinkola Plantation and ending back at Pebble Hill’s Sunrise Field, where the Land Rovers parked in a U-shape for the admiring and judging portion of the day. That’s where the Rally’s other sponsor, Orchard Pond Organics, which produces honey, grass-fed beef, and other products, would be awarding prize packages for the tastiest cocktail and the best Land Rover. Scarcely had I parked before Jeff and Mary Phipps, the owners of Orchard Pond Organics, enlisted my help in judging the cocktails and the Rovers. Jeff seems to have figured marriage out, too. Tiger Berard of Valdosta, GA, came to the Rally in a gorgeous red ‘96 Defender 130 Tdi that he said he borrowed from a customer. As the owner of Pete’s Foreign Otto Shop in Valdosta, Tiger said he’s no stranger to Land Rovers. 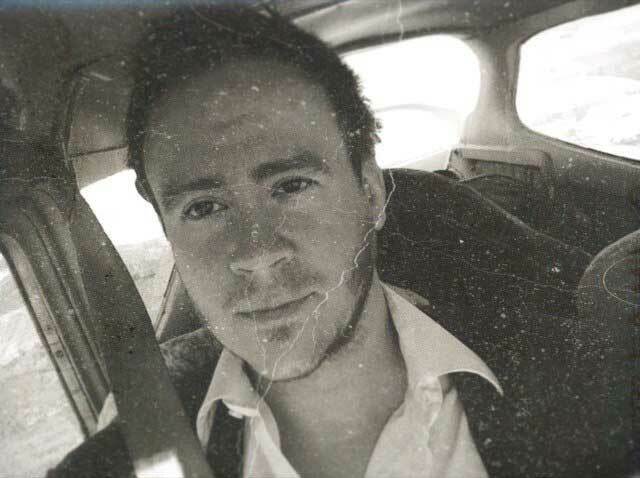 He’s not even sure how many he’s owned over the years; his very first vehicle, at age 16, was a ‘65 Rover 2000 TC sedan. 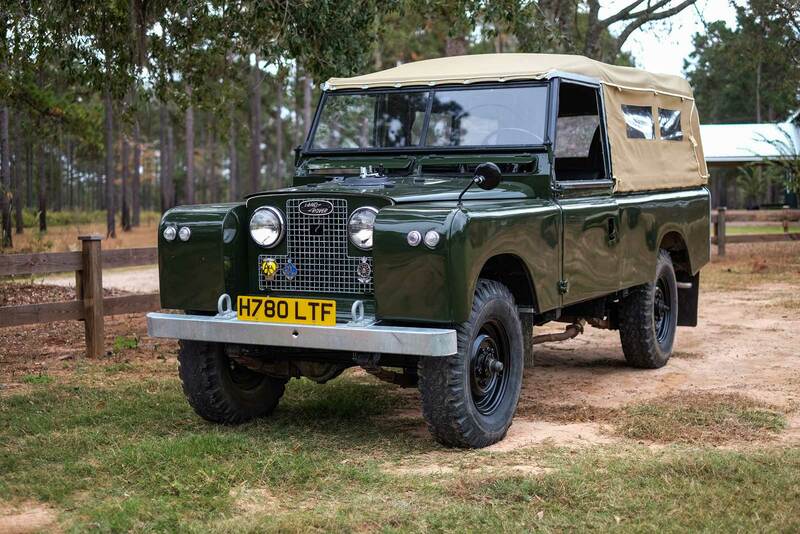 Tiger also once owned a 1967 3500 S and said he’s owned at least five Discoverys, including the Discovery he got his son when his son turned 16, passing on the family tradition of the first vehicle being a Land Rover. J.T. Rieck of Thomasville told my favorite story of the day. I walked up and caught him explaining how he’d come to purchase his 1974 Series II 109” from a widow friend and I made him start the whole story over for my benefit. The Series III didn’t run. It just sat in the lady’s garage in Houston, Texas. “I had to bring a trailer to get it,” J.T. said. And then moments after he towed it out of the garage, the lady zipped her BMW convertible into the same spot. Turns out, she didn’t mind selling it for just $500 because what she really wanted was to be able to park in her garage. There were lots of other great Rovers to be seen and great stories to be heard in Sunrise Field. Spencer Young was there, driving a beautiful ‘64 Series II-A, owned by his business partner, Ed Millere. Together they own Grassroots Coffee in downtown Thomasville. 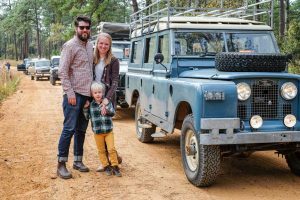 Spencer and his brother also own Sturdy Brothers which makes artisan waxed canvas and leather goods, and they recently founded Overland Accessories, making products for overland travel. I begged him to show me some of their goods but they don’t have anything ready to sell yet. Maybe they will in time for next year’s Red Hills Rover Rally. This event deserves an encore. Jeff Phipps’ great-great grandfather bought the Orchard Pond Plantation in the 1930s, and within its grounds, his family—Mary, children Kennedy  and Sophia —harvest organic fruits and vegetables to make their own granola and pesto. A group of skilled apiarists maintain beehives that produce a delicious honey. 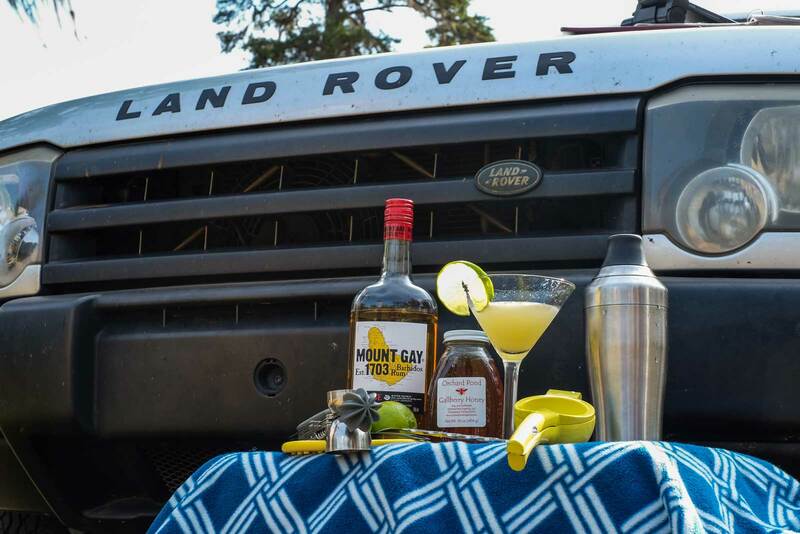 Cocktail contest entrants were instructed to use Orchard Pond’s Organic Honey in a drink recipe. The results were creative and delicious. Photographing the Red Hills Rover Rally was a genuine pleasure. After climbing into our respective Rovers, the group started out on dusty trails leading through various plantations bordering Pebble Hill. The weather was perfect for an adventure, the sort of day one could wear a light cardigan if they preferred, but would be completely comfortable in a t-shirt. Mingling with the crowd of vintage Land Rover owners brought back memories of previous rallies, expeditions in foreign countries, braving thick mud pits and routine repairs. 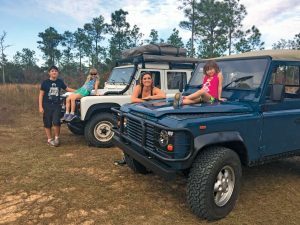 All their tales revolved around cherished experiences with their Land Rovers. I usually photograph events solely with my digital cameras, but for this one I felt it was fitting to snap a few shots with my 1970s-era, twin lens, reflex Yashica Mat 124g film camera—vintage capturing vintage. Great event, much fun had by my crew! Hope this event becomes an annual event. Great article. Thanks so much for publishing this. RHRR was a great event.